Miners are pictured collecting ore at a cobalt/copper mine in the Democratic Republic of Congo. LONDON -- Volkswagen Group is moving to secure long-term supplies of cobalt, a vital component of rechargeable batteries, as the automaker accelerates its ambitious shift to electric cars. Cobalt industry sources told Reuters that VW has asked producers to submit proposals on supplying the material for up to 10 years from 2019. VW, which decided on the strategic shift to EVs after it was engulfed in a diesel-emissions scandal, plans to invest more than 20 billion euros ($24 billion) in zero-emissions vehicles by 2030 to challenge pioneer Tesla in creating a mass market. The company, which aims to make up to three million EVs a year by 2025, wants all the cobalt tender proposals submitted by the end of September. "The tender doesn't actually tell you how much cobalt they want. They tell you how many EVs they want to make, you have to work out the cobalt content yourself," one cobalt industry source said. VW did not respond to Reuters questions on the details of the tender but noted that the group would need more than 150 gigawatt hours of battery capacity annually by 2025 for its electric vehicles. This would mean major purchases of necessary materials. "The procurement project is one of the largest in the history of the automotive industry, with a total order volume of over 50 billion euros," it said in a statement. "That will meet the group's needs for the first wave of e-mobility." VW has said that by 2025 it will roll out 80 new electric car models across the group, which also includes the Audi, Seat, Skoda and Porsche brands, up from a previous goal of 30. It wants to offer an electric version of each of its 300 group models by 2030. Demand for cobalt is expected to soar in the coming years due to the electric vehicle revolution as governments around the world crack down on pollution. VW is under particular pressure as it had been slow to embrace EVs and self-driving technology until admitting two years ago to cheating on U.S. diesel-emissions tests. Battery and auto manufacturers will need to sign multi-year deals to secure supplies of raw materials including cobalt and lithium. The Democratic Republic of Congo produces roughly 65 percent of global cobalt supplies estimated at around 100,000 tons this year. Canada, China, Russia, Australia and Zambia are also major sources. At the company level, the market is dominated by Glencore, which produced more than 28,000 tons last year. Reuters recently reported that Glencore had signed a major deal to sell up to 20,000 tons of cobalt products to a Chinese firm, a move that could help VW secure car batteries for its shift to EVs. According to the cobalt industry sources, VW said wanted all contracts agreed by the end of the year. EVs use rechargeable batteries containing cobalt, a byproduct of copper and nickel output, which boosts energy density and extends battery life. This allows automakers to offer guarantees of between eight and 10 years. "They want a fixed price, which won't work for people who need security and they want to reserve the right to not take metal they don't need," another cobalt source said. "They want producers to take all the risks ... they want an option at low prices, for long maturities at zero cost." Cobalt is currently around $30 a pound, its highest since October 2008 and up from less than $10 in December 2015. Analysts estimate each battery uses between 8-12 kg of cobalt. That would mean VW will need 24-36 million kg a year for three million EVs, which at current prices would total $1.6-$2.4 billion. The sources said the wording of the tender suggests it will probably have also gone to lithium producers, chemical producers and battery makers. "There's a section on sustainability... asking what processes are in place to make sure the cobalt does not come from child labor in the DRC," one said. 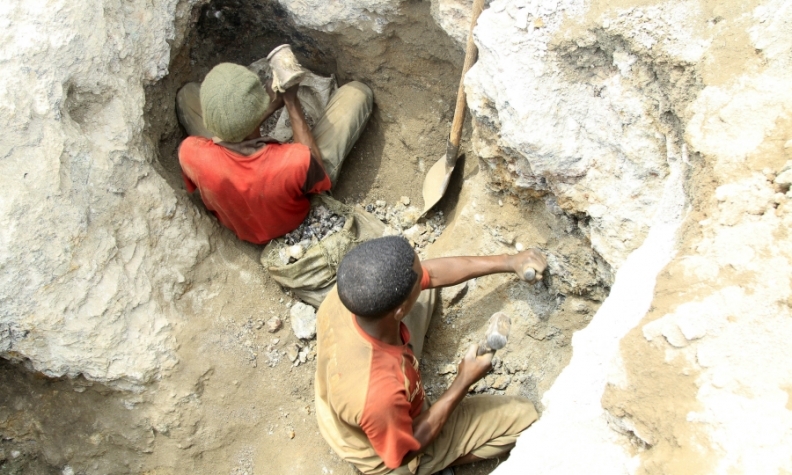 Child labor is a reference to artisanal mining in places such as the DRC, where individuals mine independently to produce metal, often illegally and under poor health and safety conditions. UBS expects global sales of EVS in 2025 to reach 14.2 million units or 13.7 percent of the total from under one million units and less than one percent this year. Analysts at CRU Group forecast the battery sector will need more than 75,000 tons of cobalt a year by 2025, up from around 41,000 tons this year.